RAC prepayment reviews are just the latest in a string of government-sponsored efforts to get inside the operations of healthcare organizations. Come June 1, expect what was already an avalanche of audits to get even bigger. That’s what Elizabeth Baskett, senior associate director for policy at the American Hospital Association (AHA), suggests many hospitals will experience when the recovery audit contractor (RAC) prepayment review demonstration program finally begins. As Baskett points out, many hospitals are already being subjected to Medicare administrative contractor (MAC) prepayment audits, in addition to reviews that are being performed by RACs, now fully active in all parts of the United States. Last year, the Centers for Medicare & Medicaid Services (CMS) announced it would launch a demonstration project aimed at strengthening Medicare by eliminating fraud, waste, and abuse. Scheduled to begin on January 1, 2012, the launch date was postponed to June 1 when the CMS took into account provider concerns that the extra administrative burden would be overwhelming. As part of the project, RACs will be able to perform prepayment reviews on certain types of claims that historically result in high rates of improper payments. These reviews will focus on seven states (Florida, California, Michigan, Texas, New York, Louisiana, and Illinois) with high populations of fraud- and error-prone providers as well as four other states (Pennsylvania, Ohio, North Carolina, and Missouri) with high claims volumes of short inpatient stays. Count the AHA as one of the concerned parties. The multiplying number of potential audits worries the organization, says Baskett, who points out that many of these auditing programs are not only “redundant and duplicative” but are also resulting in inappropriate denials. “We’re concerned that CMS is adding just another layer of administrative burden on top of the providers, and we aren’t sure this will do anything except divert resources away from patient care,” she says. The problem will be exacerbated by a recent CMS decision to increase the number of medical records RACs can request from hospitals and other institutional providers, Brocato says. The new annual limit for most providers is 2% of all claims submitted in the prior calendar year divided by eight. That’s up from the previous total of 1% of all claims. 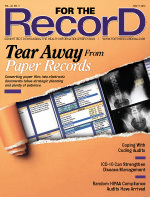 In addition, RACs can request up to 400 medical records in a 45-day period, 150 more than previously allowed. Finally, after just last year increasing the 45-day cap to 500 medical records for some hospitals with more than $100 million in Medicare severity diagnosis-related group payments, the CMS has now raised that threshold to 600. The fact that the prepayment program will be limited to 11 states could lull some hospitals into a false sense of security, says Michael Schramm, president of healthcare services for IVANS, a network and technological services provider. However, MACs have been conducting more prepayment reviews, so “you can’t tell yourself you’re OK because you’re in Alabama and not in California. No matter where you are, getting yourself prepared for prepayment reviews is going to be a necessity,” he says. The problem, according to Schramm, is that many institutions are still unprepared for what’s coming. IVANS conducted several surveys on the topic in 2010 and 2011 that showed numerous respondents weren’t quite sure how they would handle audits. Kathy DeVault, RHIA, CCS, CCS-P, director of professional practice for AHIMA, says prepayment reviews have a profound financial impact on providers. In a 2011 RAC audit survey conducted by IVANS, while 73% of providers agreed that the RAC program has helped reduce fraud and errors, more than 60% believe the audit process was unfair. In addition, respondents said that the extra time and money it takes to substantiate a RAC claim impacts budgets and resources and that the frequency with which they can be audited is an administrative workflow burden. According to Schramm, while providers do see value in the effort to drive unnecessary costs out of Medicare, some—particularly those in the states facing prepayment audits—may have a different perspective. “This may be a bit eye-opening because they could end up being audited a lot,” he says. Besides the audits’ direct impact on financial ledgers, there could also be ancillary costs such as having to add staff to deal with the onslaught. “I’ve heard of hospitals hiring additional staff specifically to deal with the audit process,” Baskett says. “I don’t know if they need to add staff in advance of being audited, but they definitely need to consider it going forward.” Depending on the organization, the additional staff could be in the form of more coders or perhaps RAC coordinators who are charged specifically with dealing with the audit process, Baskett says. Schramm believes it is crucial that providers have an individual or a team in place that will be able to manage the prepayment review process. To increase the organization’s chances of surviving the audits, the person or group in charge must create a comprehensive set of procedures that includes everything from how audit requests will be received to how they will be tracked throughout the system. Baskett points out that since hospitals have been exposed to RAC audits for some time now, they should already have taken steps to deal with audits. If not, she says, it’s important to build a team within the facility that can pull together every group that’s going to be working on the audits, including utilization review, billing, and legal, as well as the clinicians who actually work on the cases. “Then it will be important to pick one person to be the lead in managing the audits so that the hospital ensures these audits are running through the appropriate processes and meeting all the timelines,” she says. According to Baskett, a good way for organizations to prepare for prepayment audits is to self-audit. For example, if RACs are targeting one- and two-night hospital stays to see whether these stays should have been provided in an outpatient setting, “then a hospital can take a look at some of those claims and see if it has any vulnerabilities there,” she says. Clinical documentation is clearly an area where hospitals are vulnerable, says Baskett, who recommends hospitals identify physician leaders to be responsible for demonstrating the value of accurate notetaking to colleagues. “Any kind of physician education on documentation is essential,” she says. Schramm emphasizes the need to follow proper procedures when collecting the information necessary for fulfilling an audit request. Educating hospital staff on the proper steps will help keep the organization’s finances afloat. In that sense, an EHR can also help expedite the transmission of the requested information. Creating an automated process will increase efficiencies, making it essentially a business decision, Schramm says. “A hospital is going to be penalized if it doesn’t respond to an audit on time, which means you either aren’t going to get paid or you’re going to have funds taken away,” he says. An electronic process does two things, Schramm says. It creates a faster, more efficient process, and it frees up hospital resources. “If you can take staff that’s been pushing paper and instead use them to drive your business, then that’s what you want them to be doing instead of collecting all of this information, sending all of it out in a bunch of big boxes, and trying to track it manually,” he says. The CMS recognized it had to provide a more efficient way to deliver medical records to the requesting contractor and implemented an electronic submission of medical documentation program that enables Medicare auditors such as RACs and MACs to accept electronic attachments from providers.